Music can evoke emotion, stir the senses and bring memories back to life. It has the power to make you smile, the power to make you cry and the power to make or break your day. Music has always played a huge role in a wedding ceremony with the most anticipated part being of course, the wedding processional music. Walking down the aisle and being greeted by warm smiles from all your friends and family is a priceless memory and one that can be perfectly encapsulated with the right piece of processional music. 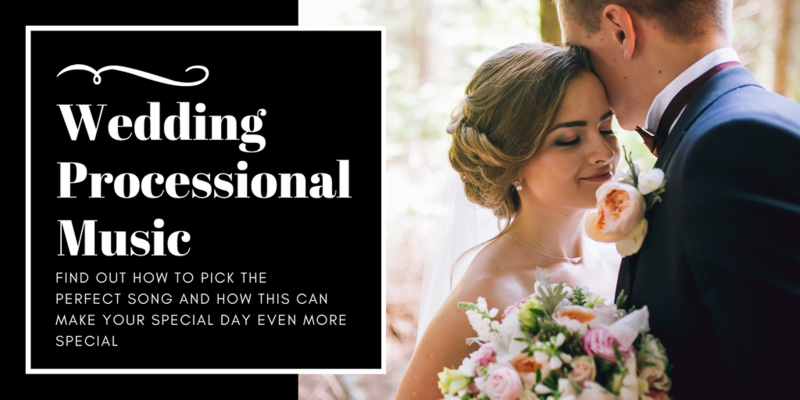 When it comes to choosing your wedding processional music there are a few points that are worth considering: Firstly, think about the type of atmosphere that you are wanting to create. Will it be a formal service or a more casual ceremony? Do you want music that is traditional in flavour or would you prefer to have more modern music to reflect the occasion? Would you opt for classical music or a pop song? How about a piece of film music or a song from one of your favourite musicals? Whatever the style of music, you should think about how your music makes you feel when you listen to it, an obvious but important point nonetheless. It may for example be a beautiful piece of music that you love, but if it always makes you want to cry, then you might not wish to feel that additional emotion as you make your way down the aisle. A piece that you both enjoy listening to. A piece that hopefully holds some significance to one, if not both of you. Once you have settled on your piece of music, the next decision you will need to make will be whether to have a musician perform it live on the day, or to simply have it played through a music player of some kind. If you are hoping to employ a live musician or musicians to perform your piece, you should also consider any lyrics. If your piece does have lyrics, how important are they to you and your partner? Will you need them to be sung by a live singer on the day or will you be happy with a purely instrumental cover? When it comes to booking live musicians, you should try to hear your piece played or sung all the way through prior to your wedding in a ‘live’ situation. Every musician will perform your piece in a slightly different way and so it is important that you have an opportunity to hear your processional music played live, before you eventually walk down the aisle. In an effort to help those of you who may be currently stuck for ideas in choosing your entrance music, the following selection will hopefully be a useful starting point. They have all proven to work extremely well, both in their original forms and, more pertinently to myself as a piano player, as instrumental piano covers. Arguably the most well known piece of music to walk down the aisle to, this magnificent score is from the 1850 Opera “Lohengrin”, composed by Richard Wagner. It has been the choice for many royal weddings, making this a popular processional song throughout the western world. Written around the turn of the 17th century and originally scored for three violins and bass, this beautiful piece of music is a favourite amongst many classical music lovers and works splendidly as a solo piece for the piano. The term “classical music” should not and does not imply “old-fashioned” and this beautiful piece of contemporary solo piano music by the world-renowned Ludovico Einaudi is proof. It works most effectively as a piece of processional music as the subtle changes in the melody work as perfect “entrance points” throughout the procession. The title of this piece by Einaudi means simply, “white clouds” which perfectly encapsulates the relaxing and peaceful atmosphere of the music. It has been used in Film and Television and is a very effective piece when performed for the procession. This is a very romantic and expressive piece of piano music by the Korean composer Yiruma, and, for reasons similar to I Giorni, it is a great choice for the procession. Featured memorably in the film “The Twilight Saga – Breaking Dawn Part 1”, this highly romantic love song translates to solo piano beautifully. As an instrumental, it manages to retain the mood and essence of the original version, making it perfectly suited for a modern wedding. Written by Labrinth and Emeli Sandé, Beneath Your Beautiful featured on Labrinth’s debut studio album entitled “Electronic Earth”. This R& B ballad is extremely popular and as a result it is often requested as a song for the procession. Ellie Goulding’s version of the 1990 Waterboys song “How Long Will I Love You” is by far one of the most popular entrance songs of the last five years. It’s tempo, mood and beautifully simple melody are a winning combination that really set the scene for a romantic entrance. “Make You Feel My Love” is a song written by Bob Dylan although it has been recorded by many other artists including, Billy Joel, Garth Brooks, Bryan Ferry and Kelly Clarkson. Adele’s version of the song is certainly one of the most popular, and as an entrance song it works wonderfully as a solo piano cover. This song was released in 1997 and has for the last twenty years proven to be a favourite for many with it’s beautiful lyrics and catchy chorus. It is another song that translates superbly to solo piano. This highly romantic love song was written and produced by Andrew Lloyd Webber for his 1986 musical, “The Phantom Of The Opera”. It’s theme (originally written as a duet) is about commitment and romance between two people…what could be more appropriate for a wedding ceremony? Composed by Craig Armstrong for the 1996 film “Romeo and Juliet”, this is a piece of piano music that is hauntingly beautiful and one that will create a very emotional and romantic atmosphere for the ceremony. This song works extremely well on solo piano, not surprising really as it was written by the great Elton John. The song featured in Disney’s 1994 animated film, The Lion King and it is now a favourite at weddings. Richard Curtis’s romantic comedy “Love Actually” is a film that stirs the emotions, particularly around Christmas time. The music was composed by Craig Armstrong and the Glasgow Love Theme is at the very heart of the film. This is another popular choice and one that was specifically written with the piano in mind. One of the most memorable Disney theme tunes ever written, Tale As Old As Time is an absolute classic! Composed by Alan Menken for the 1991 film Beauty And The Beast, it is a song much loved by both the young and older generations.